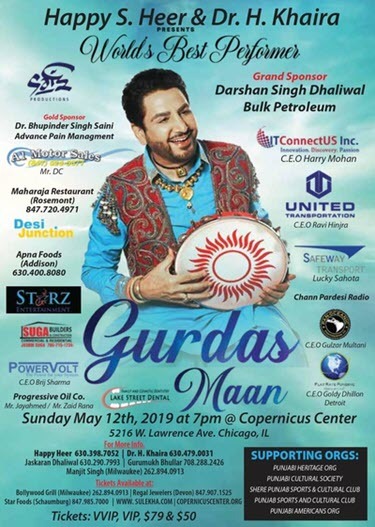 Gurdas Maan, legendary singer, will perform live Punjabi songs in Chicago on May 12, 2019. This shining star of Punjabi music has maintained an unprecedented universal appeal and won the heart of many global audiences. Gurdas Maan is a singer, songwriter, and actor from Punjab, India. This talented musician burst onto the Punjabi music scene in the late 1970s, when he took the industry by storm with his unique vocalization, and innovative and highly stylized lyrics and music. He captured the renaissance of the Punjabi music form, which had previously existed in the 1950s and 60s. Gurdas Maan is also known for starring in several blockbuster Bollywood films. This is the man who started singing as a hobby and never thought he was good enough to become a professional singer until he started winning competitions at college. Since then he has exerted some kind of tidal pull over his audiences. This college lecturer who holds a Masters degree in Physical Education and a black belt in Judo exploded into the music world in 1982 with his first recording ‘Dil Da Mamla’ and turned the success of this album into a fruitful film career. Gurdas Maan has practically held the franchise for the promotion of Punjabi values through his performing prowess and emotion rich songs. His ‘Apna Punjab Hove‘ has become a veritable anthem for Punjabi people throughout the world.